TORONTO -- It's never too early to begin to compare, contrast and ultimately predict who the better pick will be when the 2015 NHL Draft takes place at BB&T Center in Sunrise, Fla. 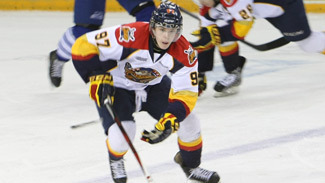 In a draft that looks to be loaded with offensive and defensive talent across the board, there are two headliners starring at center for their respective teams in Connor McDavid of the Erie Otters in the Ontario Hockey League and Jack Eichel of the United States Under-18 National Team Development Program in the United States Hockey League. Both players possess two qualities that are tough to teach: work ethic and big-game ability. They each represented their country at the 2014 IIHF World Junior Championship in Sweden; McDavid for Canada and Eichel for the United States. NHL.com asked nine scouts in attendance at NHL Central Scouting's final meetings this week for their personal choice between the two. The impromptu poll had McDavid earning a slim 5-4 victory. "You're talking about two wonderful players who are going to be a big part of the NHL in the future," USA Hockey director of hockey operations Jim Johannson told NHL.com. McDavid (6-foot, 185 pounds), who won OHL Rookie of the Year in 2012-13, earned three honors in the league's Western Conference this season for best playmaker, best skater and, for the second straight season, best stickhandler. He finished fourth in league scoring with 99 points (28 goals, 71 assists) in 56 regular-season games, and has 165 points (53 goals) in 119 career games. Forward Joshua Ho-Sang of the Windsor Spitfires in the OHL skated alongside McDavid for the Toronto Marlies in the Ontario midget hockey league in 2011-12. Ho-Sang, who had 31 goals and 79 points in 30 games with the Marlies, is No. 18 on NHL Central Scouting's midterm list of the top 2014 draft-eligible skaters in North America. He's currently under the microscope this week during Central Scouting's final meetings in Toronto to determine the top 2014 draft-eligible prospects in North America. Ho-Sang, the fifth player taken in the OHL priority draft by Windsor, was impressed with the young superstar. "He's a very special player; he's going to be the best," Ho-Sang said. "He's gifted, but the one thing that I just think is crazy that no one ever seems to catch in any of the interviews I've seen is his work ethic. "They never talk about it and I think that's wrong. They make it seem like he's dropped on the earth with the talent he has, but I've seen Connor develop. I've known him since he was 9 years old, and I believe his work ethic has taken him to that place." McDavid is being labeled as the best pro prospect since Sidney Crosby. "McDavid never takes a shift off and, to be honest, I believe may be the one to beat in the 2015 draft," Central Scouting's David Gregory said. "But as we know, Eichel has the whole year to prove himself." Eichel (6-1, 191), a Boston University recruit, leads the U-18 Team with 71 points (32 goals, 39 assists) in 43 games despite being the youngest player on the team. "His speed and strength are uncommon in a player his age, and those attributes allow him to get separation on the ice offensively and excel defensively," U-18 coach Danton Cole said. "I would also add that his compete level is very high and he wants to win regardless of the situation, even at the end of practice. The bigger the moment in our games, you can tell he wants to end it and he has the ability to do so. Coaches like that in a player." When asked to provide an NHL comparison to Eichel, Cole suggested either Ryan Getzlaf of the Anaheim Ducks or Jeff Carter of the Los Angeles Kings. "He has the size and scoring, plus the good stick like those two players," Cole said. "I think his skating explosiveness is off the charts though." Boston University defenseman Matt Grzelyck liked what he saw in his future teammate when the two played together for the U.S. at the 2014 WJC. "He's so impressive; his skating stride is unbelievable," Grzelyck said. "He's got all the tools, for sure, and is fun to watch." When inquired about McDavid and Eichel, a few of the scouts couldn't help but include 6-2, 201-pound defenseman Noah Hanifin of the U.S. U-18 NTDP in the 2015 draft discussion. Hanifin, committed to Boston College in 2015-16, had eight goals, 32 points and 34 penalty minutes in 45 games for the U-17 Team. Upon his promotion to the U-18 Team, he produced one goal and eight points in four games. 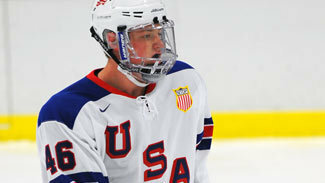 "He is really skilled on the back end, can get the puck out skating or passing," U.S. scout Greg Rajanen said. "He can lug the puck up the ice and dish in neutral ice; he's an elite skater, passer, and he runs the power play. He makes great decisions and is creative with the puck; he has all the components."